Scania V8 biogas engine. Scania launched a new 16-litre V8 biogas engine at this year’s Middle East Electricity (MEE) trade fair in Dubai. As the product portfolio expands to meet customer demands and emission legislations, Scania presented engines for power generation using alternative fuels in order to provide sustainable solutions. “Scania is at MEE to show that our engines are adaptable to the different needs of our customers. This new biogas engine is ahead of the curve. 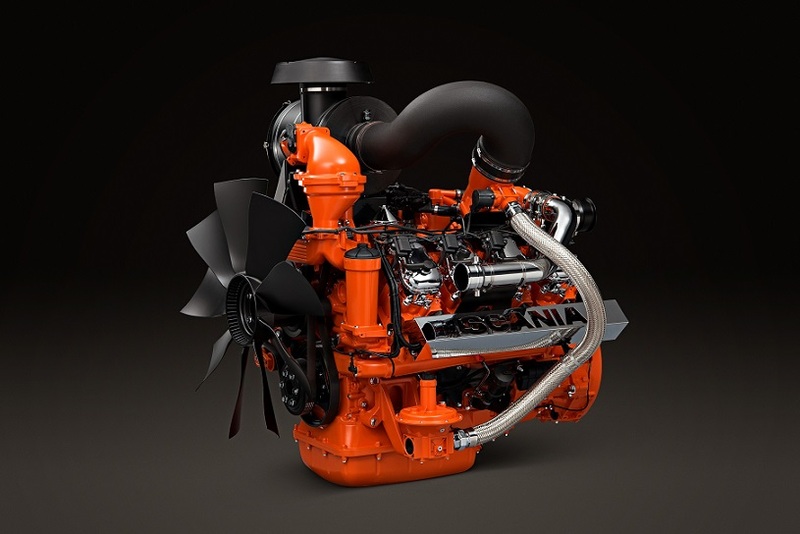 We hear more and more from our customers that they are interested in this type of gas engine,” says Hans Petersson, Global Product Manager Power Generation, Scania Engines. The new biogas engine shares components, parts and systems, thus ensuring availability and access to fast and reliable service from almost 2,000 Scania service points worldwide. “The offering is a part of Scania Engines’ sustainability goals. We see an increased interest in gas engines across the world,” says Petersson. The OC16 V8 biogas engine, is a 16-litre V8 for power generation purposes. It features output ranges from 320 kW for COP (continuous operating power) and is switchable between 1,500 / 1,800 r/min at 360 kW for PRP (prime power). Scania’s products are all part of a modular system which provides parts that are tried and tested and built in large series, drawing on the company’s experience in truck and bus as well as in industrial and marine applications. The products share components, parts and service, thus ensuring high availability and access to fast and reliable service from close to 2,000 Scania service points worldwide. Scania is a world-leading provider of transport solutions. Together with our partners and customers we are driving the shift towards a sustainable transport system. In 2017, we delivered 82,500 trucks, 8,300 buses as well as 8,500 industrial and marine engines to our customers. Net sales totalled nearly SEK 120 billion, of which about 20 percent were services-related. Founded in 1891, Scania now operates in more than 100 countries and employs some 49,300 people. Research and development are concentrated in Sweden, with branches in Brazil and India. Production takes place in Europe, Latin America and Asia, with regional production centres in Africa, Asia and Eurasia. Scania is part of TRATON SE. Scania a bio-metano. Durante la fiera MEE di Dubai è stato presenta la nuova versione del motore a gas Scania OC16, alimentato in questo caso con biogas: un carburante rinnovabile, completamente naturale, sostenibile che viene ottenuto tramite i rifiuti organici.